President Trump is proud of the 3.9% unemployment rate, the lowest since 2000. But it’s not as great as it sounds. Employers added 164,000 jobs in April, which was lower than forecasts but still okay. Employers have created an average of 200,000 new jobs each month so far in 2018, which is a strong pace of job growth. But the unemployment rate, which fell from 4.1% to 3.9%, is a puzzlement. There were fewer people looking for jobs in April, which means fewer people counted as unemployed. When unemployment falls because people get jobs, that’s good. But when unemployment falls because people give up looking for jobs, it’s not so good. For that reason, our weekly Trumpometer says: MEDIOCRE. Economists struggle to explain two oddities in the current labor market. The first is the relatively low portion of working-age Americans who have a job or are looking for one. The so-called labor-force participation rate is 62.8%, a level it has generally been stuck at since 2014. The peak was 67.3% in 2000. So while the unemployment rate is back to the low levels of 2000, the portion of Americans working or looking for work is considerably lower. An aging labor force might explain part of the problem, since workers aged 55 to 64 — a bracket that is swelling, as the baby boomers age — are less likely to work than younger folks. The opioid epidemic might keep some people who would otherwise have a job from working. Recent research from the Conference Board suggests more people consider themselves disabled these days, a third possible explanation for the low participation rate. The other oddity is weak wage growth, with wages rising just 2.6% during the last 12 months. Ordinarily, employers hike pay as unemployment drops and workers become scarce. I'm with Bernie. Free stuff for me. Interesting to me is that the high water mark for labor participation was still under 70%, in 2000. I wonder how long that statistic has been calculated? I would have thought that sometime,in our history, the working age labor participation rate would have been higher. These figures mean nothing, if not widely understood. There SHOULD be a figure for how many people want to work, how many are able to work, and how many are working both full time, and part time. Then over time, movements would mean something. As it is, numbers lack clarity. Interesting. That link goes back to 1950. I was surprised to learn that 1954 was the lowest. In the mid-40's, every advanced economy except the US bombed the heck out of each others' factories, giving us a competitive advantage. In the 50's, women were much less likely to work than today, and the first of the boomers were young children, so women that would work were at the point in their lives where they were most likely to stay home. Bless the June Cleaver's that made suburbia what it was. Trump should just quit. He can't do anything right. This makes complete sense (which is Probably why it didn't cross my mind). People who have stopped looking for a job are not in the numbers. There was an article in the Dallas newspaper about a program in Finland that is stopping. They gave homeless people $600 a month. They thought these homeless people would use the money to improve their lives, get job training, get a place to live, buy clothes, get a job. If they got a job, they had to give part of the money back. NO ONE GOT A JOB. Finland is ending the program. It is likely the same here. They are on so much government hand-out, there is no reason to get a job. Down the page shows the rate for other countries. But, if we can but barely know what our number means then those for other countries are truly opaque. As was the case when Obama was trying to tout low unemployment or at the very least back to the early Bush 43 era levels...I went to look at what most economists consider a more accurate unemployment rate number...the U6. This is not at all a good thing. We have a large group of entitlement addicted, able bodied adults who are doing absolutely nothing and have been for a long time with little skills or skills that haven't been used in quite awhile. Though some may work for the cut (cash-under-table) or self-employed, I'm willing to bet most are on the dole. We have a institutional debt problem that is unsustainable and can't last much longer without serious spending reforms, and welfare abuse is low hanging fruilt. Which leaves this group in a very shaky and untenable position, and the consequences of eliminating that could be quite explosive for the nation. In other words, we have a potential rent-a-mob powder keg waiting to launch into plunder and destruction the moment the checks end. Or (and?) we have a bunch of formerly two-income families who have decided that the second income simply isn't worth the extra costs (daycare, etc). I don't disagree with anything in your post, I've just been wondering for awhile if maybe part of the drop in the LFPR isn't simply because people gave up on keeping up with the Jones'. There may be some of that. People are burnt out trying to keep up with a world that is going faster and faster every day. Hell, I'm burnt out. I've slowed down my life a great deal the past several years. Not because I'm getting older, it's just that living simpler has more reward. I wouldn't be surprised if there is a siginficant contingent of couples that have decided to do more with less. 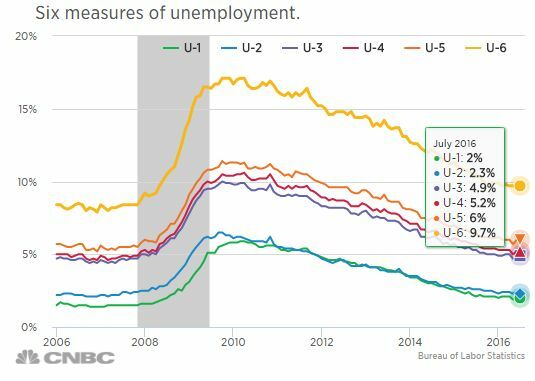 It looks like the U6 number is TRENDING DOWN. Let's also be fair, it has been trending down even when Obama was President. Yes it's trending down. But there are factoes as to why as well. Could be they found a job...could be they decided they had a disability and are now getting free government cheese that way or they just stopped looking. IMHO the real proof we're back on the right track will be an increase in the labor force participation rate. Right now the amount of jobs we're adding each month is the same as when Obama was in office.